The Graduate: Carson Kelly, St. Louis Cardinals. Although Kelly was last in the majors in early June, he exceeded 45 days on the active roster. Technically, he graduated in May, but I continued to list him for instructive purposes. Now, I am moving on! As a prospect, Kelly is an excellent defender with a serviceable bat. Unfortunately, he remains blocked by Yadier Molina. At this point, Knizner has surpassed Kelly in the eyes of many, including me. Joey Bart, San Francisco Giants. The second overall pick in the 2018 draft, Bart is off to a blazing start to his career. This month in the Northwest League, he blasted 9 home runs (.333/.379/.747)! Questions persist regarding his hit tool, receiving grades ranging from 40 to 55, but the power is certainly legit. Will Smith, Los Angeles Dodgers. After launching 7 home runs in June (.275/.390/.609), Smith hit 8 more in July (.265/.358/.559). Over his last 41 games, he has 15 home runs! This power outburst, along with his power breakout last year (.216 ISO), forces reevaluation of his power tool. Grade Change: power tool increases from 45 to 50. William Contreras, Atlanta Braves. The younger brother of star catcher Willson Contreras, William has similar upside at the plate. In July, he finally started tapping into his above-average raw power, hitting .300/.370/.625 with 15 extra-base hits, including 5 home runs. Eric Haase, Cleveland Indians. Arguably, Haase is the greatest beneficiary of the Francisco Mejia trade. Now, he likely is in line to be the potential catcher of the future for the Indians. This past month, Haase showcased his massive power with 7 home runs (.293/.330/.606). Of course, he also struck out plenty, including 9 strikeouts in his last three games to close the month. Ryan Jeffers, Minnesota Twins. A second round pick in the 2018 draft, Jeffers is easily transitioning to pro ball. After destroying the Appalachian League (.422/.543/.578), he earned a promotion to Low-A. Since arriving, Jeffers already has 7 extra-base hits in just 7 games (.321/.406/.714). Zack Collins, Chicago White Sox. The prototypical three-true-outcome slugger, Collins continues to walk (20.8%) and strikeout (29.6%). However, the power is yet to truly manifest much in games this year (.177 ISO). More troubling is the recent spike in strikeouts. Since the beginning of June, Collins has 70 strikeouts (32.9%). Meanwhile, behind the plate, he has allowed 76 stolen bases in just 56 games this year. Keibert Ruiz, Los Angeles Dodgers. On July 20th, Ruiz turned 20 years old. As such, age-context is important in evaluating his performance in Double-A. Unfortunately, it came with a .188/.317/.362 batting line and a 5-for-34 slump over his last 11 games. M.J. Melendez, Kansas City Royals. This year, Melendez is enjoying a strong season, displaying excellent defense and plus raw power. The only hiccup in his full season debut has been tons of swing-and-miss (30% strikeouts and 17.8% swinging strikes). In July, Melendez is hitting just .196/.283/.370 with 33 strikeouts (30.4%). Shortly after the All-Star break, the Indians traded Francisco Mejia to the Padres for Brad Hand. Now, Mejia only has defensive specialist Austin Hedges standing in his way. The trade likely assures he will receive a long look at catcher and soon. Meanwhile, the acquisition of Mejia dampens the future outlook of fellow Padres catcher Austin Allen. Sean Murphy suffered a broken right hamate bone in early July, which will sideline him until mid-to-late August. The Braves promoted Alex Jackson to Triple-A and Brett Cumberland to Double-A. Then, the Braves traded Cumberland to the Orioles as part of the Kevin Gausman package. The Graduate: Jake Bauers, Tampa Bay Rays. 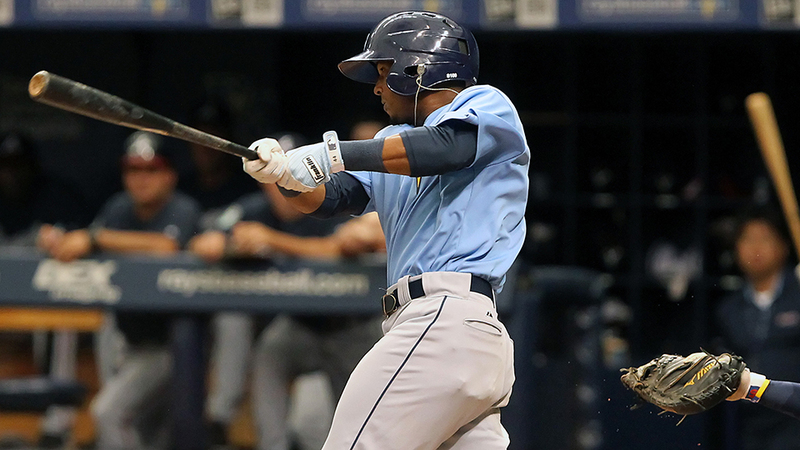 In early June, the Rays promoted Bauers to the majors and he has not looked back. Since his promotion, he has shown patience (12.5% walk rate), hit for power (.249 ISO), and stolen 3 bases. Although his power pace likely will slow, Bauers should be a solid, but unspectacular, fantasy contributor (.260/.340/.440, 15-20 home runs, and 5-10 stolen bases). The Graduate (finally): Daniel Vogelbach, Seattle Mariners. Like Kelly above, Vogelbach exceeded rookie limits in May, but remained in consideration for these lists until this point. This year, he is once more destroying Triple-A pitching (.305/.456/.582) and struggling in the majors. Given his elite patience, he remains a worthwhile hold in on-base percentage formats. In others, it may be time to move on. Nathaniel Lowe, Tampa Bay Rays. The older brother of fellow Rays prospect Josh Lowe, Nathaniel surpassed his younger brother this year. After a dominant showing in the Florida State League (.356/.432/.588), he has not slowed in Double-A (.333/.432/.613). In July, Lowe had more walks (20) than strikeouts (15) with 8 more home runs. Grade Change: hit tool increases to 55 and power tool increases to 55, moving Lowe into the top 100 overall. Grant Lavigne, Colorado Rockies. The Rockies selected Lavigne 42nd overall in the 2018 draft and aggressively assigned the 18-year-old to the Pioneer League. There, he has been unstoppable (.371/.458/.581), battling Kyle Isbel as the top performing bat. As a teenager among college draftees and more advanced competition, Lavigne has been extremely impressive. At this point, he is a potential first round fantasy prospect pick and top 200 prospect. Kevin Cron, Arizona Diamondbacks. Quietly, Cron is having a monster season in Triple-A (.330/.381/.593 with 18 home runs). This past month, he elevated his game even further, hitting .387/.452/.656. Although the Pacific Coast League is hitter-friendly, it is difficult to discount much of his performance. With Paul Goldschmidt blocking him at first base, Cron has received most of his starts at third base. If he receives an opportunity, he could surprise. Nick Pratto, Kansas City Royals. Advertised as a potential plus hitter as a first round pick last year, Pratto has disappointed. Since he is just 19 years old in Low-A, patience is necessary. However, Pratto has amassed 116 strikeouts (28.9%) as a late-count hitter. As he continues to struggle, dreams of a plus hit tool begin to dim. Roberto Ramos, Colorado Rockies. Possessing huge, 70-grade raw power, Ramos has mashed 26 home runs between High- and Double-A (.275/.381/.596). As a 23-year-old playing in the California League (and Lancaster), he was old for level and enjoyed extremely favorable hitting environments. Closely monitor his performance in the far more difficult Eastern League. So far, the power remains (.291 ISO), but strikeouts prevail (35.4%). Lewin Diaz, Minnesota Twins. A fractured thumb mercifully ended Diaz’s season. Prior to the injury, he hit just .161/.194/.232 in July and .224/.255/.344 on the year. Triston Casas will miss the rest of the season after undergoing surgery to repair the ulnar collateral ligament in his right thumb. The Rockies traded Chad Spanberger to the Blue Jays for Seung-hwan Oh. Obviously, the move from Colorado is detrimental to Spanberger’s long-term outlook. Garrett Hampson, Colorado Rockies. With an injury to D.J. LeMahieu, the Rockies turned to Hampson. A speedster, he has 33 stolen bases between Double- and Triple-A, and another already in the majors. In addition to the speed, Hampson is a patient, all-fields hitter, who has hit .300/.370 or better at all levels. Despite hitting for decent pop in the minors, he has well below-average power, but it could play into 10-15 home runs in thin air. Owners in all formats should speculatively add Hampson, if not already owned. David Bote, Chicago Cubs. This year, Bote has played all over the field and profiles as a solid major league bench bat. If he runs into regular playing time, he is a borderline-average hitter with average power, which carries value in deeper leagues. So far, Bote is making the most of his limited playing time (.340/.431/.528). Jeff McNeil, New York Mets. One of the best minor league performers (.342/.411/.617), McNeil earned a look at the big league level. Following the trade of Asdrubal Cabrera, he even could find his way into regular playing time at second base. Prior to this year, McNeil hit for nominal power throughout his career. In fact, his 19 home runs are 10 more than he collectively hit prior to this season. Regardless where his power lies, McNeil is a solid, high-contact hitter. If his power plays, he could be a late-blooming .265, 20-home run option at second base. In other words, he is a great speculative add in deeper leagues. Isan Diaz, Miami Marlins. A rough start to the season for Diaz (.193/.320/.320 through May 29th) is now in the rear-view mirror. Since then, he hit .299/.401/.521 with 6 home runs and 8 stolen bases in Double-A. In mid-July, the Marlins promoted Diaz to Triple-A, where he started strong (.250/.368/.500). As a three-true-outcome hitter at second base, he carries plenty of potential fantasy value. Luis Rengifo, Los Angeles Angels. This year, Rengifo has flown through the minors, from High-A all the way to Triple-A in mid-July. Although he having a fantastic season (.312/.413/.472 with 38 stolen bases), he has nominal power and less speed than his numbers suggest. Still, Rengifo is making serious noise and could surprise. Ramon Urias, St. Louis Cardinals. The older brother of Luis Urias, Ramon spent the past five years in the Mexican League. The Cardinals scooped him up this offseason after he experienced a power outburst last year (.340/.433/.577). This year, Urias bounced between Double- and Triple-A, hitting .301/.360/.556, with much of that damage coming this month (.368/.434/.765 with 5 home runs). Ultimately, he likely serves as a bat-first utility infielder, but the bat is quite good. Jahmai Jones, Los Angeles Angels. In early June, the Angels promoted 20-year-old Jones to Double-A. Given his youth and position change to second base, he has understandably struggled at the plate and in the field. These struggles amplified in July, as he hit just .229/.340/.349 while committing 6 errors in his first 18 games in Double-A. Shed Long, Cincinnati Reds. Following a blazing start, in which Long slashed .301/.366/.507 through May 18th, he slumped over the past two-and-a-half months. Most recently, he is 1-for-19 with 8 strikeouts over his last five games and hitting just .204/.295/.333 in July. Max Schrock, St. Louis Cardinals. This is not the summer of Schrock. He followed up an atrocious June (.238/.270/.313) with an equally poor July (.224/.274/.341). With little power and speed, he will need to return to his high batting-average ways to have any fantasy relevance. Although the White Sox announced Nick Madrigal as a shortstop, he has played all but one game at second base. Further, he has no strikeouts in his first 62 plate appearance (.321/.371/.377). The Nationals promoted 18-year-old Luis Garcia to High-A earlier this month. He is the youngest player in the Carolina League by nearly a year (Bryan Mata). The Cubs’ first round pick in the 2018 draft, Nico Hoerner will miss the rest of the season with a left elbow injury. The Twins promoted Luis Arraez to Double-A after a blazing June in High-A (.449/.487/.617). The Graduate: J.D. Davis, Houston Astros. Davis is back in the majors, receiving regular playing time at third base with Carlos Correa on the disabled list. Upon Correa’s return, he likely will head back to Triple-A. Davis is a below-average hitter and defender with huge, 70-grade raw power. Ryan Mountcastle, Baltimore Orioles. Since returning from a fractured hand, Mountcastle has been fantastic (.307/.359/.504). Most importantly, his plate approach has improved by leaps and bounds. In 240 less plate appearances this year, Mountcastle already has four more walks (21). Grade Change: hit tool increases from 50 to 55. Nolan Gorman, St. Louis Cardinals. Entering the year, Gorman was a favorite as a top-5 pick in the 2018 draft. An uneven spring drew questions regarding his hit tool and defensive home. As such, Gorman fell to 19th overall. Thus far, he is finding little resistance in the Appalachian League (.325/.430/.623 with 8 home runs). With 70-grade raw power, Gorman has some of the highest upside among recent draftees. Elehuris Montero, St. Louis Cardinals. At just 19 years old, Montero is the top hitter in the Midwest League and has hit .367/.436/.642 since the All-Star break. At the plate, Montero is a line drive (25.4%), all-fields hitter with plus raw power. On the downside, in the field, he is sluggish and error-prone (17). Regardless whether Montero ends up at first base, his bat should play. Taylor Ward, Los Angeles Angels. A 2018 breakout prospect, Ward will not stop hitting. Now in Triple-A, he slashed a clean .400/.500/.600 this month. Despite his gaudy numbers, most recently buoyed by a .447 BABIP in Triple-A, most continue to discount his bat. However, Ward has legitimate power, patience, and hits tons of line drives (25%). Bobby Dalbec, Boston Red Sox. An explosive professional debut in 2016 put Dalbec on the map. Since then, he has struck out a lot (37.4% in Low-A in 2017 and 31.3% in High-A this year). Fortunately, Dalbec has also hit tons of home runs, including 10 in July (.319/.414/.747). As such, he has all the makings of a future three-true-outcome slugger. In mid-July, Vladimir Guerrero Jr. returned from a month-long absence due to a knee injury. Since his return to Double-A, he continued to mash (.345/.367/.690). Alec Bohm is on the disabled list due to a hit-by-pitch on the knee, which relegated him to a walking boot and required him to see a specialist. After serving an 80-game suspension, Michael Chavis is back in action in Double-A. The Orioles acquired two intriguing third base prospects at the trade deadline, Rylan Bannon and Jean Carlos Encarnacion. Immediately after Bannon arrived, the Orioles promoted him to Double-A. The Graduate: Franklin Barreto, Oakland Athletics. Ping-ponging between Triple-A and the majors, Barreto has experienced an up-and-down season. Now, back in the majors, he is operating as a bench bat. Despite his struggles, including an unsightly 25-to-1 strikeout-to-walk ratio in the majors, he is still hitting for plenty of power. If his hit tool is passable, Barreto is a potential 20/20 hitter. The Graduate: Lourdes Gurriel Jr., Toronto Blue Jays. On July 29th, Gurriel suffered a high ankle sprain and will miss the next 2-6 weeks. Prior to the injury, he strung together ten straight multi-hit games! During that stretch, Gurriel went 23-for-46 with 3 home runs, raising his season line to .322/.340/.503. Given his recent success, he is now a top-500 dynasty asset. Willy Adames, Tampa Bay Rays. In his first taste of the majors, Adames is struggling, and hitting just .157/.204/.216 in July. Further, he is having trouble making contact, with tons of strikeouts (35.2%). On the positive side, Adames is just 22 years old, uses the whole field, and hit a home run off Chris Sale earlier this year. David Fletcher, Los Angeles Angels. Following the trade of Ian Kinsler, Flether presumably becomes the Angels’ starting second baseman. Since debuting in mid-June, he has impressed at the plate, hitting .297/.341/.398 with a minuscule 3.5% swinging strikes. A high-contact hitter, Fletcher has little power, but enough hitting ability and speed to make a fantasy impact. Wander Franco, Tampa Bay Rays. The youngest player in the Appalachian League is also its best. This month, 17-year-old Franco is hitting .361/.423/.649 with 5 home runs and a 5-to-12 strikeout-to-walk ratio. Simply incredible! Meanwhile, he is drawing universally rave reviews across the industry. Grade Change: hit tool increases to 60 and risk decreases to 35, moving Franco into the top 50 overall. Isaac Paredes, Detroit Tigers. A phenomenal start to July in High-A (.310/.394/.638) propelled Paredes to a Double-A promotion. As the second youngest player in the Eastern League (behind Vladimir Guerrero Jr.), he continued his hot hitting (.389/.467/.500). Paredes is a professional hitter with an excellent plate approach, evidenced by a 59-to-38 strikeout-to-walk ratio. Further, he is beginning to tap into his above-average raw power. Meanwhile, Paredes is playing all over the infield and is unlikely to stick at shortstop given his below-average athleticism. Gavin Lux, Los Angeles Dodgers. A former first round pick in 2016, Lux is coming into his own this year (.324/.396/.520). This past month, he lit up the California League (.360/.408/.561). Like Paredes, Lux is a professional hitter likely to move off shortstop. Despite his poor success rate (11-for-18 on the bases), he is also a plus runner. Carter Kieboom, Washington Nationals. Through July 4th, Kieboom was having his way with Double-A (.383/.431/.567). Since then, he has struggled, hitting just .195/.263/.247. The Eastern League is often a difficult transition and one to closely monitor the rest of the season. Nick Gordon, Minnesota Twins. Speaking of transitional struggles, Gordon is floundering in Triple-A (.219/.247/.309). In July, he hit rock bottom, slashing .183/.220/.250 and going 2-for-30 to end the month. A potential 2018 debut is becoming more and more unlikely. Joe Dunand, Miami Marlins. A second round pick in 2017, Dunand is struggling in High-A, hitting just .135/.204/.278 with 51 strikeouts (37.2%). Fernando Tatis Jr. suffered a fractured left thumb and will miss the rest of the season. The Rockies promoted Brendan Rodgers to Triple-A. Both Royce Lewis and Jasrado Chisholm received promotions to High-A. Both Andres Gimenez and Santiago Espinal received promotions to Double-A. Two of the top J2 international signings, Marco Luciano and Orelvis Martinez have immense power potential. Notable trades: Willi Castro (CLE to DET) and Jean Carmona (MIL to BAL). On Friday, the Monthly Prospect Update will explore outfield prospects. Stay tuned! 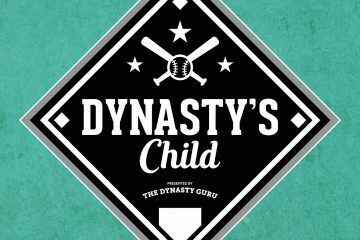 The Dynasty Guru's Triple Play: Toronto Blue Jays!